Click “More Werk” to see TWP Approved Nordstrom Anniversary Sale Top Picks for Dresses, Handbags and Accessories. Where are the dresses you asked?! Where are the handbags and accessories! Calm down, toots! I’ve got you covered. 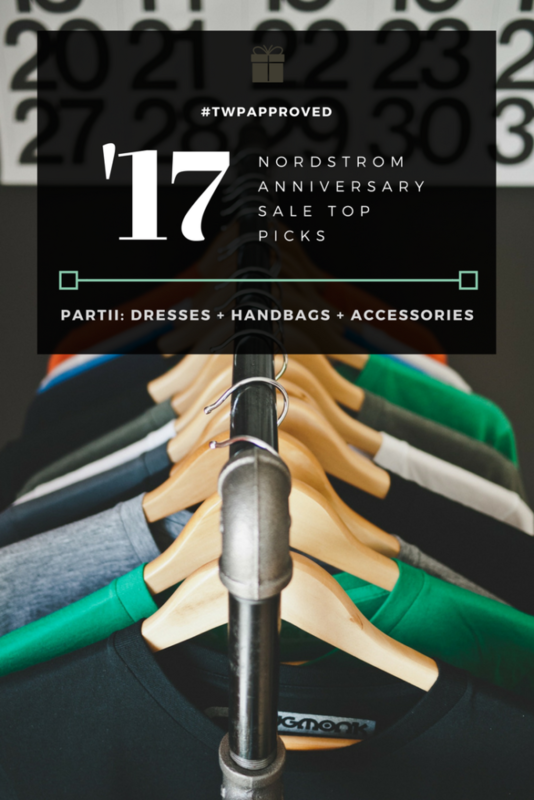 Check out my Nordstrom Anniversary Top Picks for Dresses, Handbags, and Accessories! There are some great work options in this selection and a few that you can even wear now. Of course, the off-the-shoulder and the ruffle trends are well represented, as well as a few pieces that will be great for layering in the cooler temps. Get into these dresses before the prices go up on August 7th. If you’re need of some great basic clutches and crossbodies, this top picks selection is for you. It’s a refresher for the handbag section of your closet. I mean there’s always space for more accessories. Amiright? Previous Post TWP Approved! – Nordstrom Anniversary Sale Top Picks! Love your pick of accessories! I have to express my appreciation to this writer for bailing me out of this difficulty. Right after surfing throughout the world wide web and meeting proposals that were not productive, I was thinking my entire life was done. Existing without the answers to the problems you’ve fixed all through your entire posting is a serious case, as well as ones which might have negatively damaged my entire career if I hadn’t encountered the blog. Your primary mastery and kindness in taking care of a lot of things was vital. I don’t know what I would’ve done if I had not come upon such a point like this. I am able to now look ahead to my future. Thanks a lot very much for your high quality and results-oriented guide. I won’t be reluctant to endorse your blog to anyone who needs direction on this subject. I precisely wanted to thank you so much again. I do not know what I would have taken care of without the actual aspects revealed by you about such a industry. Previously it was an absolute hard condition for me personally, nevertheless taking a look at a expert avenue you processed it forced me to leap with gladness. I’m just happy for your advice and thus believe you recognize what an amazing job you are getting into educating people today via your web site. More than likely you haven’t encountered all of us. I’m also commenting to let you know what a helpful encounter our child found reading through your site. She noticed too many issues, with the inclusion of how it is like to have an awesome teaching style to get the others with ease know precisely a number of complicated subject matter. You undoubtedly surpassed people’s desires. I appreciate you for displaying the great, safe, edifying and in addition unique thoughts on the topic to Janet. I just wanted to make a brief message in order to say thanks to you for all the fabulous guidelines you are posting on this site. My time-consuming internet lookup has at the end of the day been recognized with good quality knowledge to talk about with my family members. I would mention that we website visitors are really lucky to be in a fantastic site with very many brilliant individuals with great points. I feel quite lucky to have discovered your webpage and look forward to some more enjoyable times reading here. Thank you again for all the details. I wish to express my appreciation to you for rescuing me from such a issue. After looking out throughout the online world and obtaining techniques which were not pleasant, I thought my entire life was done. Existing devoid of the strategies to the problems you have solved as a result of this guide is a critical case, as well as those which could have in a negative way damaged my career if I hadn’t discovered your site. That natural talent and kindness in playing with the whole lot was valuable. I am not sure what I would have done if I hadn’t encountered such a subject like this. I am able to at this time look ahead to my future. Thanks very much for this skilled and sensible help. I will not think twice to recommend your web site to any person who should receive care about this area.